Best Hostel that i've seen! So friendly staff! And if you like you could have free dinner on some evenings and free drinks. Also city tours & street art walking tours are for free. It was defently not my last stay at red nest hostel valencia. 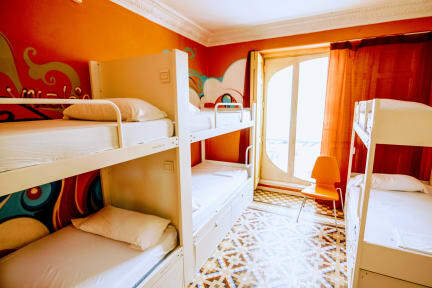 My stay at the Red Nest Hostel in Valencia was so great, that I extended my stay twice! The people who work there are very friendly, and take good care of you if you need any help! Also, it is VERY cheap The atmosphere was wonderful, I met so many nice people at the terrace. The rooms are clean, and even my 12bed-dorm was quite spacious and didn‘t feel crowded at all. All in all, I loved staying there and would definetely recommend this hostel! See you again soon :-)!! I stayed in the hostel for two nights. The staff was super nice to me! They always told me what was going on in the hostel and giving good ideas what to do. Nice place, friendly staff, good price, free dinner twice a week. Unfortunately they promot their own activities and offers a bit too hard. Very recommendable! I enjoyed free dinner Sunday night on the rooftop and staff was very friendly and helpful! Nice Hostel to stay in, the bathrooms could be a bit cleaner and there was only one socket in a room of six. Staff was super friendly and helpful and the location of the hostel is perfect!